Wanting to add some variation to your warm-ups and conditioning? Pilates exercises develop core strength, which is an essential part of circus training. The core muscles are the deep, internal muscles of the abdomen and back, including the pelvic floor and TA (Transversus Abdominus). When the core muscles are strong and doing their job, they work in tandem with the larger muscles of the trunk to support the spine. This, in turn, allows students more control of their movement and makes them less prone to injuries. A lot can be achieved in just 5 minutes of your warm up time. I love this exercise both for it’s fantastic strengthening but also because it looks so easy, students often don’t know what’s hit them until they are burning!! Start your students in a cat shape, toes tucked under. Ensure shoulders are over wrists and hips are over knees. Neck must be long, eye gaze between hands. Spine is straight with a natural curve in the lower back. Focus is on students maintaining a lifted pelvic floor (the sensation of tightening front and back passages) and belly button drawing towards the spine to activate TA.. Instruct your students to maintain their shape and hover their knees 1cm off the floor. 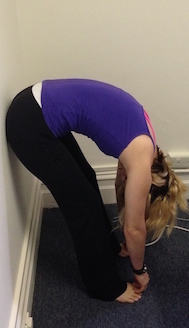 Hold for at least 30secs but this is a good one to work on building up endurance. Repeat 3 times. This is such a lovely exercise to begin and end a class with, and provides students with a real understanding of how their body feels at different points in the class. 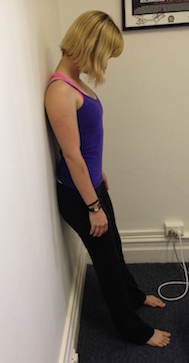 Start your students either standing with feet hip-width apart, backs against a wall and feet out in front. Start to cue their postural awareness, i.e. 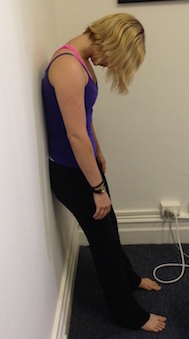 feel the back of your head against the wall (slight activation in the front of the throat), your shoulder blades flat against the wall (slight activation of the muscles between your shoulder blades), your lower back gently curving away from the wall and your bottom on the wall. Now cue the deep core muscles: gently lift your pelvic floor, and gently draw your belly button towards the spine. Maintain your core, and then start to peel off the wall one vertebrae at a time – imagine the action of peeling a banana. First, chin to chest, then upper back and finally lower back. Your arms stay relaxed and your core stays on. No wall? No problem! This exercise works just as well without a wall – just use the same cueing but get your students to use their imaginations! This warm-up exercise for legs is awesome along to a funky beat and it also challenges the most co-ordinated of students! Start your students standing in parallel, feet hip-width apart. Instruct your students to engage their core by lifting pelvic floor and drawing belly button to spine – this helps a lot with the balance. Rise up onto toes. Stay on toes and bend knees to a squat. Hold your squat and replace heels on the floor. Straighten knees to return to standing. Now, reverse the sequence – squat first, then hold squat and rise onto toes. Stay up on toes and straighten knee. Lower heels to floor to return to standing. Repeat each direction 5 times. 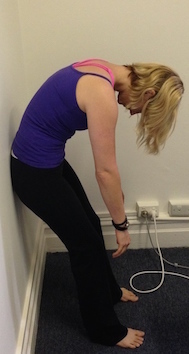 Go slowly to emphasise control and strength, or very quickly to warm-up and challenge balance. * Free Coulston has been teaching Pilates for three years, and has trained in Pilates instruction at both Dance Medicine Australia and the Australian Physiotherapy and Pilates Institute.